The Sun Ancon (Sun Harmony) Aerobic Exerciser is the invention of Dr. Shizuo Inoue, a Japanese Doctor of medicine and the former Chairman of Japan's Oxygen Health Association. Dr Inoue got his idea by watching goldfish swimming and the relationship between oxygen levels in the human body and the quality of health. He combined this with his 38 years expertise from researching oxygenating exercise, with leading German exercise physiology to develop this unique health generating and internationally patented product, the Sun Ancon (Sun Harmony) Aerobic Exerciser 'The Chi Machine'. It is based on the patented five characteristics, including height, swing frequency (140 ± 10% times per minute), swing travel (37mm Approx. ), swing angle (12 degrees approx.) and circular movement. It is a simple technological item incorporating the precise oscillatory action to ensure extensive health benefits without risk or harm that could arise from a similar product not employing stringent precision detail of the patented 'Sun Ancon' machine. A) Goldfish swimming method. 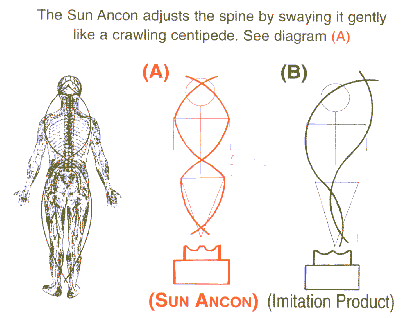 The Sun Ancon massager 'The Chi Machine' obtains an amazing body response. B) There is no body response if not using a patented precision unit and it may cause spinal injury.